Be the first to share your favorite memory, photo or story of Aaron Joseph. This memorial page is dedicated for family, friends and future generations to celebrate the life of their loved one. 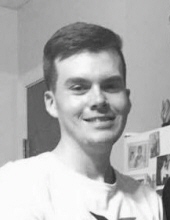 A Bardstown resident, Mr. Aaron Joseph “A.J.” Livers, age 24, passed away Thursday, November 29, 2018 at his residence after a lengthy illness. He was born January 14, 1994 in Louisville to Kimberly Minor and Thomas A. Livers Jr.
A.J. was a former employee of UPS, was an avid University of Kentucky and Philadelphia Eagles fan, and loved playing video games. He was a 2012 graduate of Nelson County High School. He was preceded in death by his maternal grandparents, Jerry and Judy Minor, and his paternal grandfathers, Thomas A. Livers Sr. and William C. “Bill” Shawler. He is survived by his mother, Kimberly Livers, his father, Tommy Livers Jr., both of Bardstown, his sister, Jess (Cole) Robertson of Raywick, his grandmother, Geneva Shawler of Cox’s Creek, his niece, Emmalyn Robertson, his caregivers, Ashley Hamiton, Zack Taylor, Dustin Morris, Katlin Bertram, Tara Hite, and Tyler Gordon, as well as several aunts, uncles, cousins, and friends. Funeral services for Mr. Aaron Joseph “A.J.” Livers will be 11:00 am Wednesday, December 5, 2018 at the Houghlin-Greenwell Funeral Home, 1475 New Shepherdsville Road. Bro. Jonathan Gann and Bro. Mickey Sexton will officiate. Interment will be in New Salem Baptist Church Cemetery. Visitation will be Tuesday from 3:00-8:00 pm. The Houghlin-Greenwell Funeral Home is in charge of arrangements. To send flowers or a remembrance gift to the family of Aaron Joseph "A.J." Livers, please visit our Tribute Store. "Email Address" would like to share the life celebration of Aaron Joseph "A.J." Livers. Click on the "link" to go to share a favorite memory or leave a condolence message for the family.